Tired of regular snacks? Or are you from Mumbai/Pune in Hyderabad and crazy for a Wada Pav or Kutchi Dabeli? Want to have authentic Wada Pav in Hyderabad? 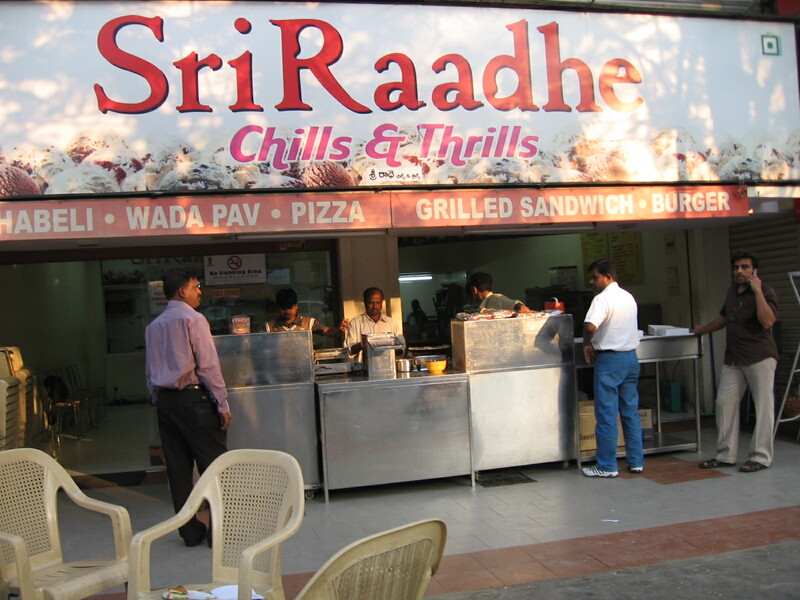 Check this food court called Sri Radhe Chills and Thrills at Hanuman Tekdi circle. Whenever you are in the surrounding areas of Koti or Abids you can taste the items available here. You will definitely love them. You will find this eatery on Tilak road or Hanuman Tekdi circle to be precise. It is exactly opposite to the Mahaveer enterprises, manufacturer and trader of home appliances. Hyderabad being a cosmopolitan city, you can get snacks famous in other regions of the country also. Wada Pav, Kutchi Dabeli and Sandwiches are famous here. Meshed potato and besan along with suitable spices is fried and sandwiched into a bun to make Wada Pav. Kutchi Dabeli, which is very rare even in Mumbai or Pune, is available here. In Kutchi Dabeli, a thick sweet and salty curry is sandwiched into a bun and roasted. Even if you are having this kind of snacks for the first time, you will relish this food. The items available here are a bit spicy, as Hyderabadies may prefer to the original one. You can also have other regular items such as Pizzas, Burgers and ice creams. They provide clean drinking water but we recommend you to purchase packaged drinking water. Washrooms are not provided but a hand wash is available outside. There is some 20 feet open place in front of this joint where more than 20 persons can sit under the cool shadows of trees. More than 10 people can sit inside. We recommend you to sit inside, as pollution outside is heavy these days. Environment is hygienic, and food is prepared in a clean environment. Service is quick and courteous. They serve food in good quality disposable plates. Overall we can say that the quality of maintenance is good. There is some reasonable space on the road where you can park your vehicles without disturbing the traffic flow. This eatery remains open from 2:30 in the afternoon till 10:30 in the night. If you want to taste Masala Pav, which is just like a Wada Pav but more spicier, you can find this unique item at Mayur Juice and Ice cream center next to it. In case, you go with someone who wants to have Paani Puri, Pav Bhaji, Aaloo toast or even pan, then again next to it is Mayur Pan Plaza offering these delicacies. There is a lot of space to sit and it can be regarded as a good hangout place but not world famous. This entry was posted on Jan 2010 at 5:05 PM	and is filed under Restaurants. You can follow any responses to this entry through the RSS 2.0 feed. Your Feedback Matters!